Yes, much uproar has been made about MBTI’s reliability (or rather lack thereof) in recent years. In this post, I will delve deeper into problems encountered in the use of the MBTI. After some thought, I believe I can reconcile claims of unreliability with claims of reliability (and meaningfulness for some test-takers). To begin with, a better question than “Does MBTI have good/poor reliability?” is “For whom does MBTI have good/poor reliability?” See the discussion (pages 290-292) in Capraro, R. M. & Capraro, M. M. (2010) about why it may be incorrect, in this case, to speak of reliability for a tool or instrument. Rather, it may be more accurate to talk about reliability for a particular evaluation or the interaction of evaluation and assessment tool. This article is available here and here. One of the limitations of personality tests like the Myers Briggs Type Indicator (MBTI) is that they are based on self-report. Hence, the validity of the results depends on the test-takers ability to objectively rate his or her own preferences across time and situations. 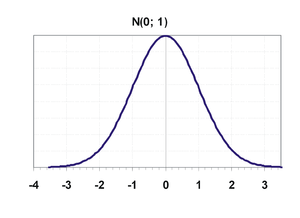 To understand why an assessment tool can be reliable or unreliable depending on use with different test-takers, imagine a distribution curve with a majority of people represented somewhere in the middle of the curve (similar to the one below) with each trait from a MBTI pair on opposite sides. Based on my experience of having friends and family members assess themselves it appears that those who learn, through experiences and interactions with others, that they fit in very well with society’s norms tend to score moderately across most, if not all, dimensions. Being more balanced on a dimension also means that it’s harder for the test-taker to draw a “best-fit line” through the scattered and zig-zagging data points that represent the test-takers perceptions of themselves through time and circumstances. Consequently there is more potential for flip-flopping and identifying with the other characteristic and it becomes, “Sometimes I test as an ENFP and then later on when I tested myself I get ‘ISFJ’ so I just don’t know!” This, of course, makes it easier for such a person to identify with multiple MBTI classifications. In contrast, those of us, fewer though we are, who express strong preferences on the personality dimensions (as represented by the edges of the distribution curve) have a much easier time drawing that best-fit line. We tend to be the ones who are drawn to testing ourselves as our life experiences and interactions with others tell us that we somehow don’t fit in with society’s norms. From my observations, it is such people for whom MBTI has reliability for, for whom classifications hold the most meaning, and for whom MBTI is a useful tool for understanding others. This explanation for why the MBTI can be reliable or unreliable, depending on the population group taking the test, is informed by my own experiences of consistently testing as extremely strong on introversion, intuitive, and thinking but consistently very weak for the judging preference. With that said, I believe that the reason why the Big Five personality test has not been found to have problems with reliability to the extent MBTI has is because the Big Five dimensions are structured in such a way that the test-taker is never faced with crossing over into introversion, disagreeableness, etc. In other words, there aren’t any personality types though everyone has some degree of extraversion, agreeableness, neuroticism, openness to experience, and conscientiousness. Interestingly, there’s a scarcity of people taking issue with changes in these scores (comparatively speaking here), though I myself have had swings in conscientiousness level when I test myself at different times and in different life circumstances. These are important issues to take into consideration when it comes to personality assessment for the purpose of determining who is most suitable for a role in a team or organization. As it becomes tempting to glean information about candidates’ personal characteristics off of the Internet (perhaps by using tools developed in the spirit of Typealzyer), it becomes ever more critical to have deeper discussions about appropriate measures and related issues. To delve further into MBTI’s limitations, here is a great critique of the MBTI by Brian Dunning and a great defense of it by Rich Thompson, Ph.D.
Update on March 6th, 2016: If you’re an INTJ looking to network with other INTJs on LinkedIn, check out the new group headed by Ruth A. Lopez and me: INTJ Strategists – Where INTJs can be INTJs! Though I usually score INTJ — with a weaker “N” as I grow older — the Typealyzer scores my blog as INTP. Perhaps my writing style obscures my “J” trait, which is quite strong. We used MBTI in my workplace in the late 1980s and early 1990s.. It was administered to employees, not candidates. The purpose was to show that there’s no “best” personality type, and that the various personality types have strengths that should be recognized. But this is a message that needs constant reinforcement and follow-through (e.g., aligning tasks to exploit strengths and avoid weaknesses). Unfortunately, there wasn’t any follow through, and MBTI results were treated mainly as a topic of conversation. Some employees even thought that they weren’t respected because they had the “wrong” temperament (i.e., ST, NF, or SF rather than NT, like most of the top people). The lesson I take from this experience is two-fold: (1) Use MBTI as a tool in evaluating the fitness of candidates for jobs where temperament or personality type is known to be important. (2) But don’t use MBTI on employees unless the company is committed to follow-through and prepared to deal with issues that may arise (e.g., the idea that there’s a “right” temperament or personality type). What I’ve noticed with the Typealyzer, since I’ve scored as INTJ and INTP on different posts, is that it seems to pick up if I’m driving towards a particular conclusion or if I’m writing in an exploratory, open-ended style. However, it’s a tool that still needs a bit of tweaking to be more accurate. For example, it doesn’t know not to read “reblogs,” so the more I’ve reblogged others’ posts, the more my N score seems to veer towards an S.
Those are great points, and I agree on both. I’ve run into HR people who don’t see when certain personality traits and performance correlate and when they do not (i.e., basically thinking personality is completely irrelevant), and so they’re reluctant to test for personality at all. I suppose it’s such people who would not know how to use this knowledge and misuse it when higher-ups decide to use tests. Another INTJ here. Typealyzer was also INTJ. I was also INTJ decades ago when I took MB as part of an MBA program. Have always found MB to be reliable with friends and relatives i.e. I can immediately recognize why they came out they way they did. Yes, I was able to predict how close friends and family members would score as well! It’s funny because I guessed that my mother and sister would get ESTJ (with a low preference for T) and my brother-in-law would get ISTJ but they didn’t accept the theory because, true to the “S” way of dealing with information, they got mired in the details of personality fluctuations across situations (i.e., “But personality is always changing, so I can’t see how MBTI could work!”). Seems that drawing a best-fit line (an average) through the data points comes more naturally to someone with an N preference.